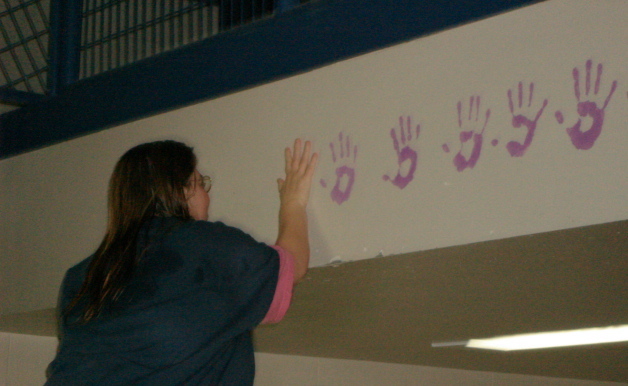 Women inmates paint their hands pledges in the common area after taking the Hands & Words Pledge together! Inmates are excited to take the Hands & Words Pledge daily and that has made a tremendous difference on how they treat one another while incarcerated. Karen Rogers, staff member, sees the changes first hand. As part of the daily Pledge Karen also read a chapter from the novel “Call Me Hope” by Gretchen Olson five days a week and received very positive feedback from inmates. This Pledge is a powerful tool take back to their families and community to integrate further into their personal lives for positive change. This entry was posted on Wednesday, July 23rd, 2008 at 11:45 am	and is filed under Law Enforcement. You can follow any responses to this entry through the RSS 2.0 feed. You can leave a response, or trackback from your own site.